What Is an English Roast Cut of Meat? 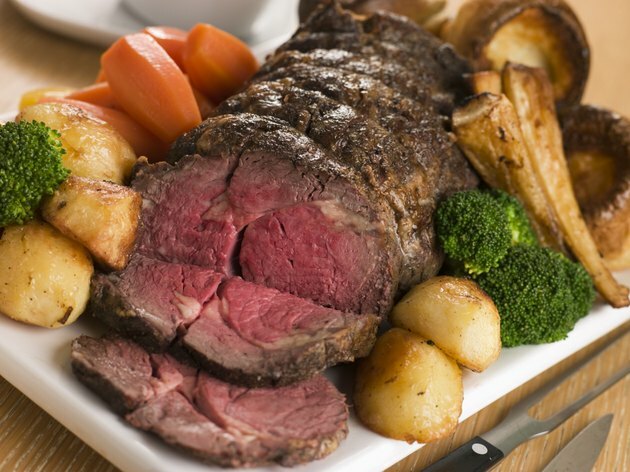 English roast comes from the beef chuck or shoulder area. Along with "English roast," it's known by a variety of names, including cross rib roast, Boston cut, beef chuck cross rib pot roast, English cut roast, thick rib roast and bread and butter cut. It suits braising, stewing and any long, slow cooking method that keeps the meat moist and tender. Butchers might use the term English roast to refer to the beef chuck cross rib pot roast cut, and boneless version of the same cut. When boneless, it's commonly called English roll. The cut originates in the beef shoulder. This area is high in muscle content and connective tissue, making it a pretty tough cut of beef. While this makes it unsuitable for quick, dry cooking -- such as frying -- it does suit pot roasting and braising. English roasts and English rolls don't suit roasting under a dry heat. The muscle fibers keep the meat tough, and the outside it likely to burn before the interior turns soft. Pot roasting works much better. The slow cooking times and added liquid keep the meat moist and melt the connective tissue. With a long enough cooking time, the meat becomes soft and tender. A 4-pound English cut roast will take around 3 hours to braise in an oven set to 325 degrees Fahrenheit. However, rather than rely on exact timings, the USDA recommends using a meat thermometer to check when the roast interior reaches 145 degrees F. They also suggest leaving the meat to rest for a few minutes after you remove it from the oven. This lets the moisture spread through the meat, rather than staying concentrated in the center. Stewing English roast makes a good alternative to braising. Stewing meat keeps it moist throughout the cooking time. Instead of leaving the English roast in one large meat joint, cut it into small cubes, around 1-inch wide. Mixed with onions, carrots, garlic, tomatoes, beef stock, herbs and seasoning, the meat makes a rich, tasty stew. Depending on the amount of meat, the stew can take between one and two hours to cook.